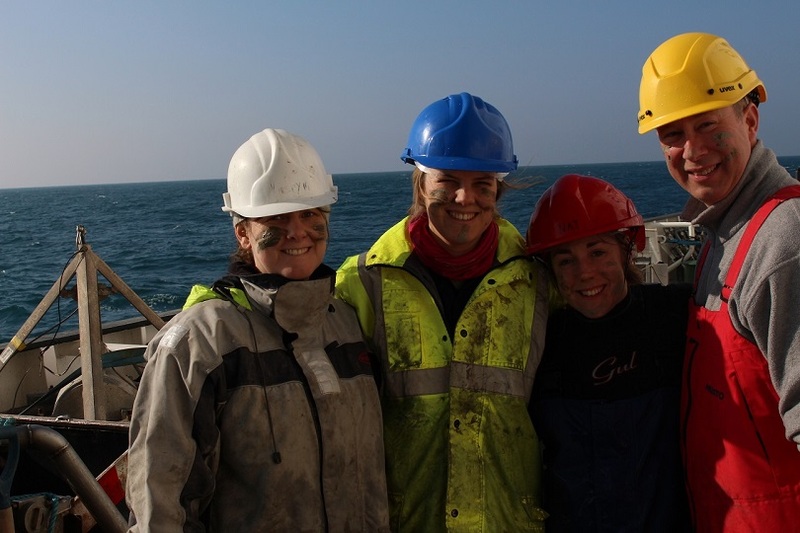 UK Shelf Sea Biogeochemistry Blog: We've finally made it! 86 hours of none stop work we have finally finished 57 spatial survey sites and we’re free to head to CANDYFLOSS. Upon reaching the total there was a massive sense of relief, but I have to say I will miss watching the sky turn from dark blue through to a pastel coloured orange as the sun rises over the first NIOZ core of the day. It has been hard work but it has also been good fun with resident RRS Discovery DJ Dave Sivyer playing the classics while we wallowed in the Celtic mud. We've had sunny days, lots of dancing, and great team work from all concerned has given us an enormous quantity of extremely useful data. Kirsty Morris, Helen Smith, Natalie Hicks and Dave Sivyer of day team. There have been ‘pin chicks’, the ‘screwdriver of destiny’ and enough mud to keep even the most voracious sedimentologist in a state of near constant euphoria. Now it’s time to get some rest while we make the 10 hour journey south to CANDYFLOSS, where we’ll be doing it all again and more before we make the 36 hour journey home!